Although cottontail rabbits play an important role in our wildlife habitats, rabbits can cause a tremendous amount of damage to crops, grazing land, trees, gardens, undermine buildings, make fields unsafe for livestock etc. Minnesota Wild Animal Management Inc. knows the secrets to trapping and removing hard to catch cottontail rabbits. What do Cottontail Rabbits look like? Cottontail rabbits are small animals with speckled brown fur, which dulls to white underneath. They have big eyes, long ears, and extensive hind legs and feet. Not often do they weight more than three pounds or reaching 15 inches in length, they are named after their tails, a small tuft of white fur. 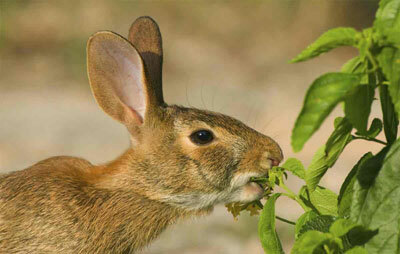 Cottontails reside in areas with clearings, fields and shrub lands. Often times, people spot these common critters in backyards and more urban settings. One of the best ways to help shield your backyard garden or berry patch is to set up a fence. It does not have to be tall or very sturdy. A fence of 2-foot chicken wire with the bottom secure to the ground or buried a few inches is generally does the trick. Although most homeowners tend to overlook this step, removing brush piles, weed patches, dumps, stone piles, and other debris where rabbits live and hide can be a great way to control rabbits. This works very well in suburban regions where fewer suitable habitats are likely to be available. Trapping is commonly the best method to remove rabbits in cities, parks, and suburban areas. The first step is to get a well built and well designed live trap. Often times it is best to leave it to the professionals to handle the rabbit situation, as they know the best methods to catch those quick critters! Don’t waste your time and money on harmful repellants and chemicals, they don’t work! Call the cottontail rabbit removal experts at Minnesota Wild Animal Management Inc. today at 612-237-8282!